Are you looking for a special guest house? 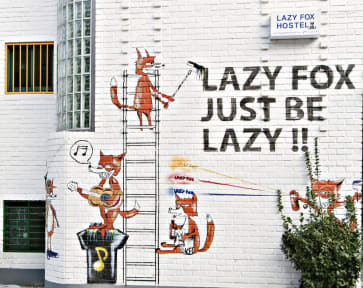 Hongdae Lazy Fox Hostel is the right place! Staying here you will meet a lot of travelers. Lazy Fox is perfect if you want to meet new friends! Lazy Fox hostel is located in the center of Seoul’s heart. Everything is just around the corner like Hongdae’s main nightlife scene. In Hongdae you can find exciting food, bars, clubs, shopping, and music! Our hostel is a short walk from Hongdae, but we are also far enough so you can have a comfortable sleep without distractions. とてもいいホステルでした。 場所も便利ですし、スタッフさんがとても親切でした。 セキュリティも部屋まで鍵がいくつもあるし、一人旅の女性でも安心して泊まれそうな宿です。 英語も聞き取りやすいし。 It was really good stay. My booking was single private room. Location is really good. Large supermarket is close.Lots of cafe, restaurant, convenience store around. Easy to walk to Hondae downtown. but silent in the night, so I could have good sleep. Staff is so kind and friendly, they are the best I have ever stayed. I will choose this hostel again next time.